Start off your visit on the 15th (Fri): get to know the fascinating history of Tomb of the Unknowns, then make a trip to John F. Kennedy Grave Site, and then stroll the grounds of Arlington National Cemetery. To find more things to do, photos, maps, and more tourist information, go to the Arlington online trip itinerary planner . Newark to Arlington is an approximately 3-hour flight. You can also do a combination of flight, bus, and subway; or drive. In February, daytime highs in Arlington are 48°F, while nighttime lows are 32°F. Wrap up your sightseeing on the 15th (Fri) early enough to drive to Williamsburg. Start off your visit on the 16th (Sat): steep yourself in history at Bassett Hall, then contemplate the long history of Historic Jamestowne, and then contemplate the long history of Jamestown Settlement. On the 17th (Sun), you'll have a packed day of sightseeing: steep yourself in history at Colonial Williamsburg, explore the world behind art at Abby Aldrich Rockefeller Folk Art Museum, and then learn about winemaking at Williamsburg Winery. For maps, reviews, ratings, and tourist information, refer to the Williamsburg tour builder app . Drive from Arlington to Williamsburg in 3 hours. Alternatively, you can take a train; or do a combination of flight and bus. While traveling from Arlington, expect a bit warmer days and about the same nights in Williamsburg, ranging from highs of 54°F to lows of 34°F. Cap off your sightseeing on the 17th (Sun) early enough to go by car to Virginia Beach. Kick off your visit on the 18th (Mon): examine the collection at Virginia Beach Surf & Rescue Museum, then enjoy the sand and surf at Virginia Beach, then admire nature's wide array of creatures at Virginia Aquarium & Marine Science Center, and finally take in the waterfront at Virginia Beach Boardwalk. 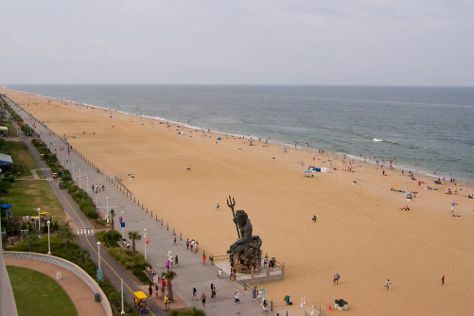 To see reviews, maps, and other tourist information, read Virginia Beach trip planner . Getting from Williamsburg to Virginia Beach by car takes about 1.5 hours. Other options: take a bus; or take a bus. February in Virginia Beach sees daily highs of 53°F and lows of 35°F at night. Finish your sightseeing early on the 18th (Mon) so you can travel back home.